wab-ramblings (click on photos for better view): Where have you been? Sorry to have made everyone wait so long for this post (5 weeks) but I had thought that when I signed up for Optus broadband I would only have to wait the maximum 10 days and not over 4 weeks. The modem only arrived yesterday and I have yet to pick it up, so I this post is still the so slowwwww dial up (which means only a few photos). 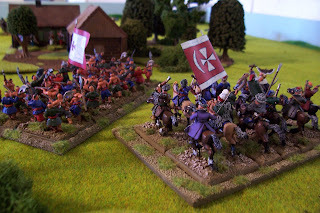 I have been a little busy with games over the last few weeks and have been able to play both WECW and WAB. Last week I actually got to use some figures that haven't seen the wargaming table for around 4-5 years. We played a nice and relaxed game of WAB at Mark's place using the the final (I hope) draft of Jeff Jonas' Successor supplement. The game was set circa 260 BC and saw a large force of Seleucid troops launch a suprise attack against a Ptolemaic force and their newly established camp. In total there was 10 large phalanxes of Pikemen and mercenary hoplites as well as 7 elephants, 100 plus light infantry and around 140 cavalry. Good fun was had by all and it was the first game that Kevin's young son James (15) actually went on the offensive (some advice added from myself and Kevin of course). To be honest Mark and Jeff had a difficult task but their lack of knowledge of the WAB rules probably aided their downfail (don't care still beat you Mark). To finish of until I get my modem and broadband hooked up here are a couple of pictures from a game that saw 2000 points of my Cossacks ally with 2000 points of Swedish mercenaries against a 4000 point force of Austrians and Brandenburgers. The battle was a difficullt one with the terrain breaking up any combined attack by both sides but James' lack of aggression allowed Kenny and I to create a massive hole in one wing of the combined army (that's why Kevin and I pushed James so hard in the next game). Until next time.